It's not about the number on the scale. We have been conditioned to see the number on the scale as the enemy. Whether that number is too low, or too high, almost everyone I know dreads the moment they step on the scale. Well, let me tell you a secret… it doesn’t even matter! Maybe you’ve heard someone at some point say that muscle weighs more than fat, or you’ve noticed that “morning skinny” is COMPLETELY gone by lunch. Or maybe you are one of the many that experience a fluctuating pant size in the matter of a single day. All of these things, are real things, and we have a machine that can prove it and tell you exactly what those numbers and sizes mean! So, next time you step on the scale and see something you don’t like, just remember that there is so much more to you than that one-sided number. Looking good on the outside begins with knowing what’s within. 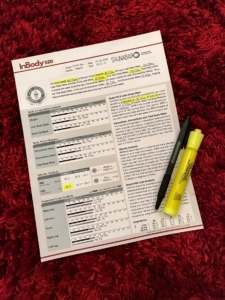 If you’re in the Los Angeles area and want to try out our Body Composition Analysis for yourself, click here or call 310-652-5522 to book your appointment today!